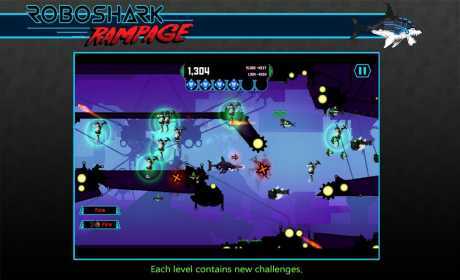 Robo Shark Rampage is an endless cave swimmer which you simply won’t be able to put down. Watch out! Don’t get hit by an anchor or mine! There are dangers lurking everywhere. 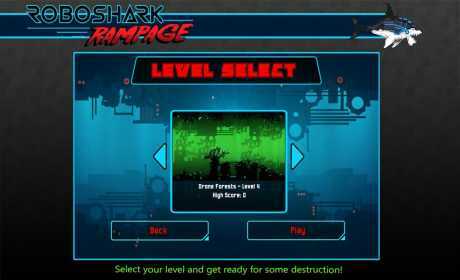 Your reflexes are put to the ultimate test as you navigate through tricky oceans. The longer you swim without losing your lives, the more credits you earn. The game offers many amazing graphics with five levels in four worlds, the Iron Depths, the Drone Forest, the Voltaic Spires, and the Cyber Nether. The weapons upgrades include a Super Katana, a Buzzsaw, a Boom Stick, and Terror from Below. 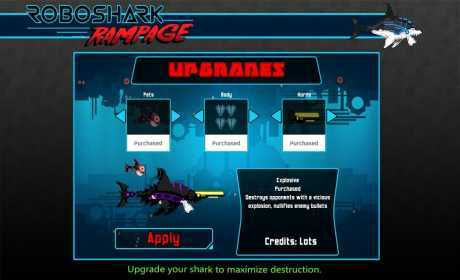 Power-ups are plentiful – you can buy minion fish and a myriad of weapons to help you tear through the waters unscathed.